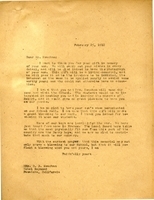 Harris & Ewing sends Martha Berry a photograph with the changes she has requested. Harris Ewing asks that the photos be returned that she deems as unsatisfactory. 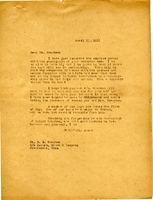 Martha Berry writes to Meacham in order to thank him for creating a scholarship in honor of his son. The scholarship will help a deserving boy at the school and will be a living memorial to Robert Meacham.